By tracking the popularity of certain Google search queries, our engineers have discovered that we can accurately estimate the level of flu in each state, in near real time. 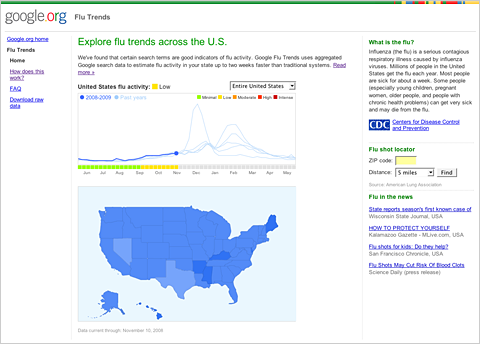 Today Google.org launched a tool, Flu Trends, that makes this information accessible to all. While traditional flu tracking systems take 1-2 weeks to collect and release data, Google search queries can be automatically counted immediately. During the last flu season, we shared our preliminary results with the Epidemiology and Prevention Branch of the Influenza Division at CDC, and together we saw that our search-based flu estimates had a consistently strong correlation with real CDC flu data. Flu affects millions, and kills hundreds of thousands every year. Early detection is critical to helping health officials respond more quickly and save lives. Flu Trends can help serve as an early-warning system for outbreaks of influenza. To learn more, check out the Official Google Blog and www.google.org/flutrends.